O God, who taught the whole world through the preaching of the blessed Apostle Paul, draw us, we pray, nearer to you through the example of him whose conversion we celebrate today, and so make us witnesses to your truth in the world. Through our Lord Jesus Christ, your Son, who lives and reigns with you in the unity of the Holy Spirit, one God, for ever and ever. St. Paul, named Saul at his circumcision, a Jew of the tribe of Benjamin, was born at Tarsus, the capitol of Cilicia. He was a Roman citizen. He was brought up as a strict Jew, and later became a violent persecutor of the Christians. While on his way to Damascus to make new arrests of Christians, he was suddenly converted by a miraculous apparition of Our Lord. From a fierce persecutor he became the great Apostle of the Gentiles. He made three missionary journeys which brought him to the great centers of Asia Minor and southern Europe, and made many converts. Fourteen of his Epistles are found in the New Testament. He was beheaded in Rome around 66 A.D., and his relics are in the Basilica of St. Paul Outside-the-Walls near the Ostian Way. 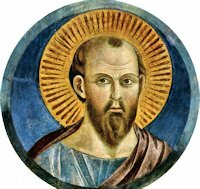 St. Paul was born at Tarsus, Cilicia, of Jewish parents who were descended from the tribe of Benjamin. He was a Roman citizen from birth. As he was "a young man" at the stoning of Stephen and "an old man" when writing to Philemon, about the year 63, he was probably born around the beginning of the Christian era. Patron: Against snakes; authors; Cursillo movement; evangelists; hailstorms; hospital public relations; journalists; lay people; missionary bishops; musicians; poisonous snakes; public relations personnel; public relations work; publishers; reporters; rope braiders; rope makers; saddlemakers; saddlers; snake bites; tent makers; writers; Malta; Rome; Poznan, Poland; newspaper editorial staff Archdiocese of Philadelphia, Pennsylvania; Diocese of Covington, Kentucky; Diocese of Birmingham, Alabama; Diocese of Las Vegas, Nevada; Diocese of Providence, Rhode Island; Diocese of Worcester, Massachusetts. Symbols: Book and sword; three fountains; two swords; scourge; serpent and a fire; armour of God; twelve scrolls with names of his Epistles; phoenix; palm tree; shield of faith; sword; book. Often portrayed as: Thin-faced elderly man with a high forehead, receding hairline and long pointed beard; man holding a sword and a book; man with 3 springs of water nearby. Visit this section on Catholic Culture prepared for the Year of St. Paul in 2008. God our Sustainer, we praise you for your loving kindness, for upholding us in times of trial, and showing us your light in times of darkness. Transform our lives so that we may be a blessing for others. Help us to live unity in diversity as a witness to your communion, Father, Son and Holy Spirit, one God now and forever. Amen.